One of those players is former slugger Mark McGwire. Just a few years ago, it seemed a foregone conclusion that he would end up in the Hall of Fame. Not too long ago, any suggestion that he might not would have been ludicrous. Now, nothing seems certain. There is little doubt that Mark McGwire was one of the most feared baseball players at the plate in the history of the game. Few players have dominated the field at the plate like McGwire did in a career that spanned decades and a variety of teams. He first became known for wearing an Oakland A’s uniform and then electrified the entire nation in his pursuit of the single-season home run record in 1998 by competing neck and neck against Sammy Sosa of the Chicago Cubs. 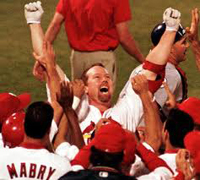 McGwire beagan his career in in 1986 by playing for the As and then finished his career in a St. Louis Cardinals uniform and ended his career in 2001. In that time, he also set the world of Major League Baseball on fire, and was credited with returning interest in the game after player’s strikes and other things derailed the popularity of the national past-time for a while. All of that happened during his pursuit of the single-season home run record in 1998. 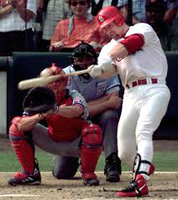 The race between McGwire and Sammy Sosa sparked the entire country and McGwire would ultimately beat Roger Maris single-season home run record by hitting 70 home runs in 1998. He ended his career with a total of 583 homers and a career batting average of .263. He also notched 1,414 RBI. He was a 12-time All Star and two-time World Series champ. He won a Golden Glove for his field work in 1990 and the Silver Slugger Award three times. He was the American League Rookie of the Year in 1987 and won the Home Run Derby in 1992. These days he is still active as the hitting coach for the Dodgers. Now, with the first round of voting ignoring those who made their impressive stats during the steroid era, suddenly the sure thing that was Mark McGwire is no longer such a sure thing. And many are wondering, and debating, if leaving out these players is the right thing to do. He has more chances, of course, but will he end up on the outside?